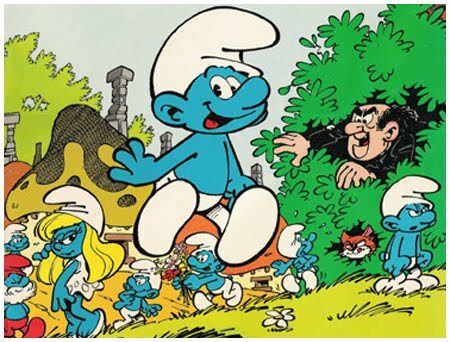 Shaken Not Stunned: Obsequiousmelon went to see the smurfs movie and wants to know where Gargamel is???? 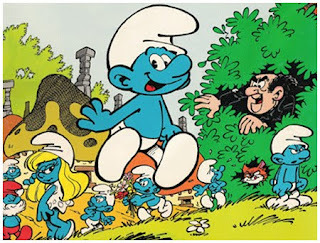 Obsequiousmelon went to see the smurfs movie and wants to know where Gargamel is???? I’ll be honest. The Ultramarines movie was the most disappointing thing since The Phantom Menace... Oh wait hang on maybe thats a bit harsh. It certainly was disappointing though. Now let me be clear I’m not going to go on some nerd boy rage, rant. I’m going to be objective and consider it in exactly the same way I would when watching any film. So, it is incredibly exciting isn’t it? At last a 40k film about space marines. All the things we have been reading about brought gloriously to life in a CGI film... Cool... I guess. The first thing I want to do is to understand who this is made for. When films are commissioned, the producers pitch who is likely to come and see it, this helps decide things like the budget and the tone of the script. So Games Workshop had two options when they decided to make a film, they could either make a simple story designed to open up the universe to a new audience and (hopefully) new customers, or they could make a film fully immersed in the universe that will reward the current fans’ already extensive knowledge. Now you might be asking why can’t they try to do both? Well if you do that then you tend to end up with an unfocussed mess that tries to please everyone but fails in most departments just like the star wars prequels. Unfortunately this is kind of what happened. I could go on a long rant now about the hundreds of little inaccuracies that occurred in this film, from the wrong colour lenses in the helmets, to the oddity that tactical marines have apparently never been in combat as scouts, to the use of the ‘and they shall know no fear’ as a battle cry thingy. But actually these things don’t matter as long as the film is designed to open up the universe to a wider audience and the writing is good, after all Marvel have changed lots of things in their films to make their characters more palatable to a larger screen audience and that seems to be working pretty well. But then there are several issues if the film is designed for that. This brings me on to a larger point, the script. Now there are some good points, we are given a very clear hero to follow and root for in the form of Proteus. This is fine for people new to the story because he gives us someone to identify with and as he moves through the film he is the vehicle used to introduce new concepts as every conversation is in some way directed at or involves him. This also has a major down side in that it makes most of the rest of the squad either unnamed or heroically underdeveloped. We do spend some time with both Captain Severus and Apothecary Pythol but still both are criminally one note, Severus being the shouty, arrogant Captain and Pythol is the worry wart (he he he, warts...) and even Proteus is the over eager new recruit. Also if the movie is designed for a new audience then we are told chaos is bad but we aren’t told who that is or why they are bad. Sure later on we see some Imperial Fists that have been desecrated but that is 40 minutes into the film and at that point we still don’t know our characters well enough to care that much and anyway there is no clear bad guy presented in the film, we have a protagonist but we don’t have an antagonist because we are told very little about Chaos and specifically nothing about the Chaos Marines on the planet. Even when we meet the Imperial Fists we aren't told anything beyond them being the black legion, so like I said ‘where is Gargamel, you know a visible villain to add real tension?’. But then of course if the movie was made for the fans then this is ok because we have the experience to know what is going on, but then they should have more attention to detail, after all I thought Sicarius was the Captain of the second company. Either way the script is still lazy because we don’t know any of the characters beyond very shallow representations of archetypes. This has a knock on effect when we land on the planet. There is a very obvious attempt to build tension and an uneasy atmosphere by having undefined movement in the shadows but the scene fails because by this point we don’t care about any of the marines. On top of this the writing seems lazy because there doesn’t seem to be any attempt to make the marines appear as a convincing military unit because of a few subtle but important things. Number one, again the script lets us down with simplistic instructions like ‘move to the left and you move to the right.’ Even in Dawn of war we hear more complex commands. Secondly they are landing near a site that has a beacon calling for aid, yet they display no caution, they just walk along in the open in a loose flying v formation like some migrating ducks! Now I’m not a military expert but anyone that has seen a vietnam movie would find this a little bizarre. Later on when they deal with a sniper they just get the heavy bolter guy to stand out in the open and shoot the position until it is destroyed safe in the knowledge that the enemy sniper is incompetent and wont fire in the few seconds it takes him to step out and aim at the tower. Now you might say that I am nit picking but little details are important and can take you out of the movie and break your suspension of disbelief. Speaking of breaking my suspension of disbelief... The visuals. I have seen a lot of people saying that the visuals are ok but not the best as though this is something we should excuse. In a world of Pixar movies we have come to expect that movies made on computers should be of a high standard. In this movie we have marines that appear to have had a stroke as their faces are paralyzed. When they leave the planet there is a scene where the chaplain is looking in the codex/relic and one of the Ultramarines looks at Proteus as though he is signaling concern at what the Chaplain is doing. The problem is that the faces don’t really change in any way and that means it undermines the attempt to build tension. This is just one example but it runs through the entire film, whenever the space marines have their helmets off their faces lack an real ability to emote properly and this then breaks my suspension of disbelief again. In several places this is also made worse by several different things, not only are we being distracted by the bland faces, often the lighting is poorly done and their movements are strangely jerky, especially when they move through the air or quicker than a slow jog. This is also coupled to bad editing and direction which also takes you out of the action. There are two examples of this that were obvious but there are many smaller examples. Firstly when Proteus shoots at shadows after they first land on the planet he stops shooting and then a few seconds later the Captain shouts to stop shooting, twice. The dialogue doesn’t mesh with the visual which makes the greatest soldiers that mankind has ever produced seem incompetent and laughable. Later on one of the Ultramarines has the back half of his head sliced off, he slumps to his knees and lands face down in front of everyone. The Apothecary walks over and says “Head wound, fatal...” Again it is an unnecessary comment that becomes laughable when coupled with the visual. However it isn’t all bad as when John Hurt arrives as the Imperial Fist’s Chaplain the movie starts to pick up as he seems to understand his character and lends some gravitas to the whole proceedings, but even he is ruined by turning his back on a fire fight when the chaos marines are still shooting at them and when the twist finally comes and the possessed character is revealed it isn’t a surprise and we don’t care about the people involved enough to be engrossed or concerned. Well, to you guys I present two other models of how to go about making films with a small monetary outlay. The most obvious comparison would be to Marvel. They wanted to make films about their characters to boost flagging comic book sales and so they made a deal with FOX. This deal is now very famous, it simply was that they sold the rights to make a film using their characters. However FOX had to make a film using each character every so many years or the rights reverted back to Marvel. Marvel kept some of their characters in their own control so that once they had profited from the first films being made they could open Marvel Studios. Now we see Marvel Studios making the Iron Man films, The Hulk, Thor, Captain America and The Avengers. So already they have regained control of The Hulk and some of the X-Men characters. GW could have done the same, let a movie production house make a Creed film, or a Pedro Kantor film and rake in profits and then start up their own films with the Ultramarines etc. Secondly there is a film out at the moment called Monsters which a British guy made on his laptop for about ten quid. Most of the budget for the film was used for promotion after he had sold it to Vertigo Films and the post production sound mix done by Dolby. I raise this as an example simply because the effects in that film are amazing but the whole film was edited and the effects created on the same type of laptop that I am using to write this review. So to sum up I am hugely disappointed by this film. It’s ok but seems sloppy, cheap and rushed. I mean it is cool to see a 40k movie and I hope they make more, but it could and should have been so much more.